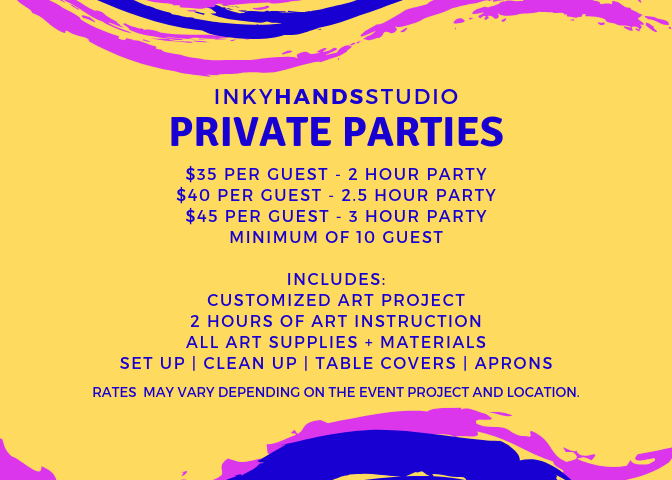 Inky Hands Studio will come to your chosen destination and provide a guided art class for any type of occasion. Gather your friends, choose an art project, and enjoy your creative celebration together. Office Party • Corporate Event • Fundraising Event • Team Building Activity • & so much more! Work directly with you to customize a project for your event. Offer step-by-step instruction and guidance. Take photos during your event. Provide hassel-free setup and cleanup. Provide a space (interior or exterior) at your choosen venue. Time: Each event is unique. Events run between 1 - 3 hours. You decide how long your event will run. Project Choices: Inky Hands Studio primarily offers canvas, glass, and wood sign painting. New projects are always being added. See our gallery for project ideas. If you have a special project in mind for your event, let us know and we will work with you to make it happen. Event Photos: Our instructor will take photos during your event and share them with you. Note: Please read the Party Contract Terms . ​Please Lynne to request quote for your event.